Based on decades of research on home destruction by wildfire, USFS Fire Scientist Jack Cohen formulated the term and concept of the ‘home ignition zone’ or HIZ. Jack discovered that you absolutely CAN affect fire behavior in and around your home. Simple modifications to your home or structure, and the rest of the home ignition zone, can have a dramatic and desirable effect on wildfire behavior. The home ignition zone is an area that includes your home and its immediate surroundings. If your home ignition zone is properly conditioned, your home can survive a wildfire. Properly done, your home may even survive a wildfire with no intervention. The home ignition zone rarely extends past two hundred feet from your home. 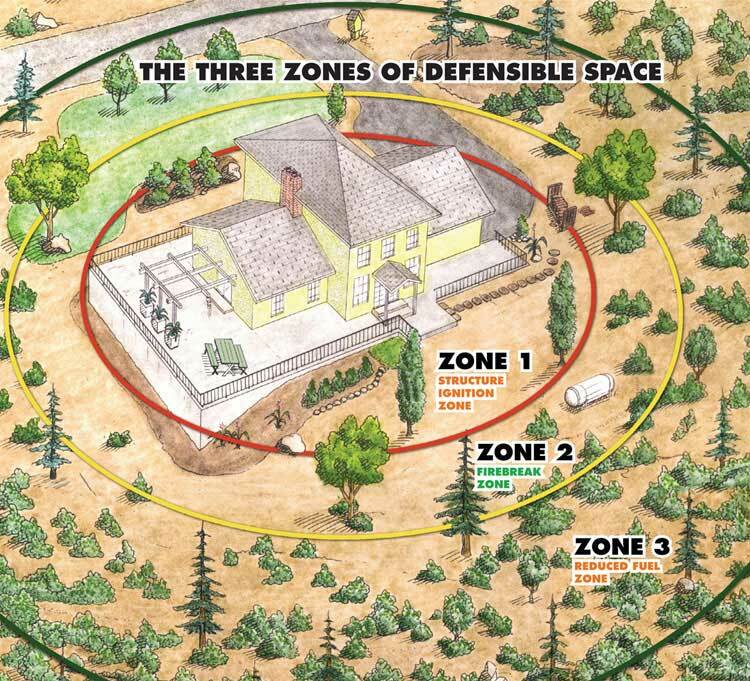 The home ignition zone regards property from the perspective of a wildland fire. Hardening your home and your home ignition zone against wildfire is easy, and highly desirable. The Firewise Communities USA program of the National Fire Protection Association recognizes the fact that the home ignition zone is where your home will either survive, or be destroyed, in a wildfire situation. The NFPA created this program to focus on educating homeowners about simple steps they can take to protect their lives & property in the home ignition zone. Firewise Madera County has enthusiastically embraced the fact of the matter that your home can be made to withstand fire by denying fire the conditions of combustion in the home ignition zone, as discovered by Forest Service Fire Scientist Jack Cohen. Begin with your home ignition zone assessment, starting with your home itself, and work out from there. Preparing this zone to deny fire the conditions for ignition is how we all can have a hope of affecting fire behavior. The myth of a tsunami like wall of fire is false. A wildfire is simply a series of ignitions in any given area. Realizing this, we can change fire behavior in our individual home ignition zones. Being ready for wildfire in your home ignition zone is easy, and extremely critical to your home’s potential survival. Firewise Madera County uses the CAL Fire term “harden your home” as a great way to illustrate this preparation. Structures are fuel to a fire. If we can reduce the flammability of structures, we reduce fire. Starting at the center of your home itself, even indoors, and moving out to the full extent of your home ignition zone, “hardening” your home and the zone against fire ignitions and carrying fire, can potentially save lives and property. Your life, your family’s, your property, your memories. Jack Cohen is a research physical scientist with the US Forest Service who has done over three decades of study on structure fires in the wildland urban interface. Jack was a founder of the Firewise Communities USA recognition program. Jack studies the physics of wildfire from a strictly logical, detached perspective, looking only at the evidence at hand. Since the 1970s Jack has been studying the causes of structure fires from the perspective of the conditions necessary for combustion being present, or not being present. By examining the evidence left behind, Jack can largely determine what caused a particular home to ignite, and others to be spared. What Jack discovered is pretty astounding. Jack found that it’s usually the little things that cause most home losses to wildfire. He found that the radiant heat from a crown fire, or the fire front, is rarely sufficient to ignite a structure. Jack’s discovery that it’s extremely rare for a home or structure to burn from the fire front, or “direct flame impingement,” led him to one simple conclusion. He found that there is much you can do to save your home from wildfire. Because what usually destroys homes is the overlooked little things ignited by embers, sparks, firebrands or clinkers, you can simply and easily deny the conditions of combustion from a wildfire approaching your home. Armed with all of this information, Jack discovered that you can easily influence fire behavior at and around your home, long before the fire arrives. Jack formulated the home ignition zone.